How pretty is the pattern on this opal marble bottle?! I absolutely love my S'well bottle, and it really does keep drinks as hot or cold as long as it claims to. I feel like I have so many winter scarves, but nothing thin enough to wear through March and April when I still like to layer a bit. With the great price of this printed option, I want one in every color and pattern! Minted has the cutest notebook designs right now, and I love that they can all be personalized for free with your name. As you can see, I'm all about the spring patterns, and this one on a phone case from Rifle Paper Co is wonderful! Essie nail polish - totally the perfect size for an Easter basket. The colors in this spring nail polish are great, but if you're more about the bright colors, they also have a resort colors set this season. Makeup brushes and sunnies, no explanation needed! Do you have a pom key chain yet? Mine makes it so easy to find my keys in my bag! Obviously, I had to go for a few clothing options, too, since I'm dreaming of tank tops and shorts. This lace top would go so well with these Lilly shorts. I first saw this style on Chesson's blog and absolutely love them. Last but not least, the Easter basket to put it all in. This boat tote is the right size for a day at the beach or by the pool! Love that boat tote! I have one for Jack and I've always wanted to get one for myself too! We have the Xl and it holds so much! I just thought about purchasing that essie nail polish mini kit yesterday! It's so cute and the perfect spring colors! i am a nail polish addict - good colors right there! and i NEED that swell bottle in my life. and i have a large boat tote and it is so so handy! I love that bottle, the pattern is perfect! I love the Minted spirals so much, but I haven't actually bitten the bullet and bought one! That pineapple one looks too cute to pass up though! If your hubby does a basket for you, I'm officially jealous!!! I love all of these! I need to show my husband this post to give him ideas for my basket! Lol. I've been wanting a Pom keychain really bad! I love when the spring nail polishes come out! Our studio sells the S'well bottles and everyone I know who has one swears by it! I really need to get on board. I also need to get Freddie on board with adult Easter baskets---yes, please! Really cute ideas! I'd definitely be ecstatic is someone gave me a basket with these goodies. I especially love those shorts...they're so different/unique. 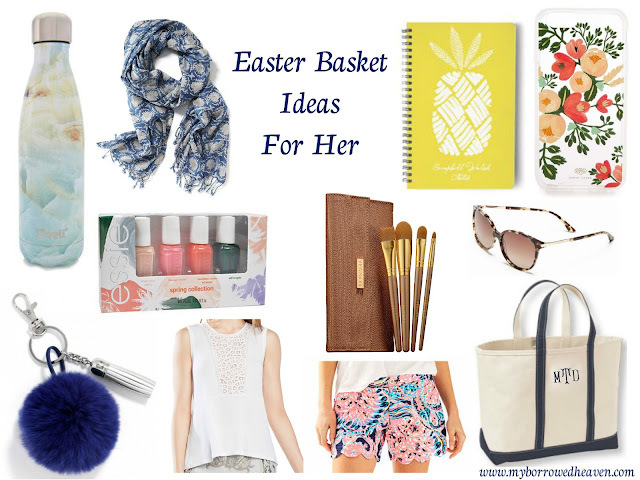 I love all these ideas girl, always a great excuse for fun Spring goodies! Those shorts & shades are fab! Looove that lace top and phone case! I seriously need that top and those shorts, a new boat tote with my new initials would be nice too :) sending this to Dave! That swell bottle is SO pretty and I looove those Essie polish colors! I love these ideas. I've been trying to convince my husband we should get Easter gifts but he's not buying it. Haha. I especially love those brushes though. These are such fun ideas! I love the brush set! I'll take on of each please. I could really use a brush set and I love Essie polishes. DUDE! I haven't been alive in blog world for forevs but I'm SUPER into your redesign!!! Also I'm ordering a pom keychain cuz I needed one before and now I need one more. ALSO did I mention I know Amanda's roommate!? I always loved getting an Easter basket when I was younger. And I definitely wouldn't mind getting one this year filled with all of those fun things!